When sitting down to what you think will be a faith movie it is surprising to hear a suspenseful musical chord and see the arrival of a train, a very Alfred Hitchcock opening. 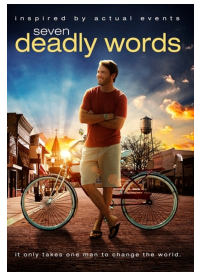 Doc Benson, the producer, director, and writer has surely taken a hint from the old master of suspense to give us a different tone for his faith film, Seven Deadly Words. Even the title has an Agatha Christie ring and it turns what has been an old story for many churches into a riveting tale that is based upon true events. Can Evan Bennett Save this Church? On the surface the story line sounds very simple. A new young minister, Evan Bennett, comes to take over an old established church in Connersville and finds that the church is in deep financial trouble. The leader of the board of deacons, Vincent Haman, and his wife Bertha have a great deal of control in the church and soon we hear that one phrase that has been the death knell for anyone with new ideas, “We’ve never done it that way before.” To add to the tension in the film Pastor Evan meets a man who once attended the church, Walt Tannin, who warns “They’ll be watching.” Later even the pastor’s wife, Elena Bennett, is told by so called well meaning ladies in regard to the deportment of her children, “We’ll be watching you, just to help out.” What seems like a peaceful community is one that is greatly divided. There are several meetings shown in the film when the pastor must deal with the deacons and congregation members in budget concerns. The big issue is that a misappropriate amount of money is going into foreign missions and the needs of the local church are being ignored. One example is a weak, leaky ceiling which will prove to be important later. The Haman couple has a vested interest as a portion of that money is going to support a daughter who is a missionary. As the pastor works to add new people and to present a budget that would save the church, there is a whispering campaign against him and his family. When it looks like the pastor might succeed, his own children and Walt Tannin are nearly killed and we find ourselves in a real mystery. The ending of the film, I won’t be a spoiler, has twists and turns that will make the viewer want sequels. Think film noir. It is possible that some who see this film will think it is promoting an anti-foreign mission theme; however, that is not the point. It is definitely a case of setting priorities and churches also have a responsibility for the needs of the local congregation and home missions as well. If a church dies, then missions are not served. There has to be a balance and there has to be compromise. For a brief time even Elena questions her husband going against what appears to be a majority. However, Pastor Evan believes firmly that “God brought us here for a reason.” He is not there because some of the deacons wanted someone to preside over the death of a church. The writer is reminded of Paul in the opening of his letter to Galatians. Paul writes that he is not witnessing to them because some board, some committee, made him an Apostle. It was Jesus Christ who made Paul an Apostle. Pastor Evan Bennett believes he is called by God to revive this particular church and in time he does gain support. Whether it is enough support you will have to see for yourself in the film. I freely admit I was not familiar with the stars in this film and have to congratulate Doc Benson and whoever did the casting on making some great selections. Roy Lynam as Pastor Evan Bennett and Guisela Moro, who portrayed his wife Elena, are the perfect choices for a couple new on the scene like this and you can believe their resolve to improve things within the church. Mark A. Ginther, as Vincent Haman, brings the right touch to seeming like a man who cares about his church and at the same time masking a sinister evil. Also very enjoyable are Shane Willimon as Brax McCoy and Wayne Greeson as Walt Tannin and it must be said that having good character actors is as important as good leads for a film to succeed. These two plus others could easily have made names for themselves in old Hollywood. Doc Benson hopes that this film will be used in churches and church conferences. I would like to see it shown in every Bible Study group, schools and colleges. Please check out the web pages below for more information. And to Doc I would say, thank you for making this very important film.